Prepare for a blend of relaxed activity and cultural sightseeing with the opportunity to meet new friends. Join us for a walk in the Montnegre Natural Park with a typical lunch in a restaurant in the mountains, a bike ride beside the sea, a cooking experience, ham tasting and much, much more! 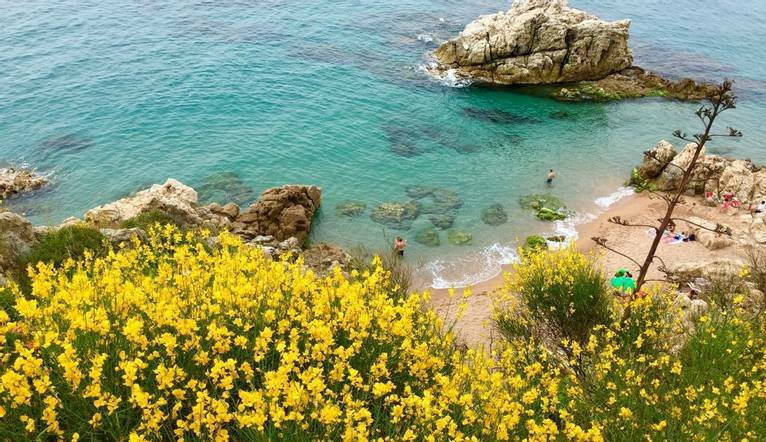 Starting in Calella we will pedal along the beach road breathing the fresh Mediterranean air before heading through the fields to Blanes, a fishing town on the Costa Brava. We will visit the the Marimurtra Botanical Garden, one of the most beautiful gardens on the Mediterranean. At the top of steep cliffs running along the sea, we can enjoy one of the most spectacular panoramic views over the coastline and get to know more than four thousand plant species, most of them exotic ones, as well as several specimens that are extraordinary because of their age and size. Hostalric is a small village located inland and is listed as of National Interest for its Culture. The town is conserved in almost its entirety and houses one of the most remarkable Catalan Medieval monumental complexes. It is presided over by an imposing 18th Century military fortress. After the walk we will enjoy a fun and tasty cookery workshop. Together with a chef we will learn how to cook the best paella and of course we will get to sample some! We will enjoy a walk in the nature park of Montnegre. Discover the Mediterranean forest and enjoy the views from the top. We will end the walk in a restaurant to enjoy a typical Catalan lunch. Walking shoes and sport clothes are recommended we will be walking approximately 8km. Today we start the day at the beach and with the first rays of sun and the Mediterranean breeze we will do some gentle yoga exercises. Later, we enjoy a healthy snack on the beach side. The transfer from Barcelona Airport to our hotel is approximately 1 hour dependent on weather and traffic. There may be some opportunities for optional tours available to you. Please note that prices shown may vary according to numbers. Full details will be given at your Information Meeting. Your Tour Leader will help arrange these for you but may not necessarily accompany you.